On June 24, 2010 an open house will be held at the recently-restored Robert Lawton Jones House in Tulsa. A Look magazine article called it the International House of Style. This 1959 beauty is a textbook example of the International Style, and the first Mid-Century Modern house in Oklahoma to be added to the National Register of Historic Places. Robert Lawton Jones was a principal architect with Murray-Jones-Murray, a firm familiar to any Tulsan who appreciates the art of minimal design. These are the folks that gave us the Tulsa International Airport, First Place Tower, Saints Peter and Paul Catholic Church and the Tulsa Assembly Center. Jones studied under Mies Van der Rohe, and it shows in much of his work. The simple lines and sparse ornamentation are hallmarks of his work. 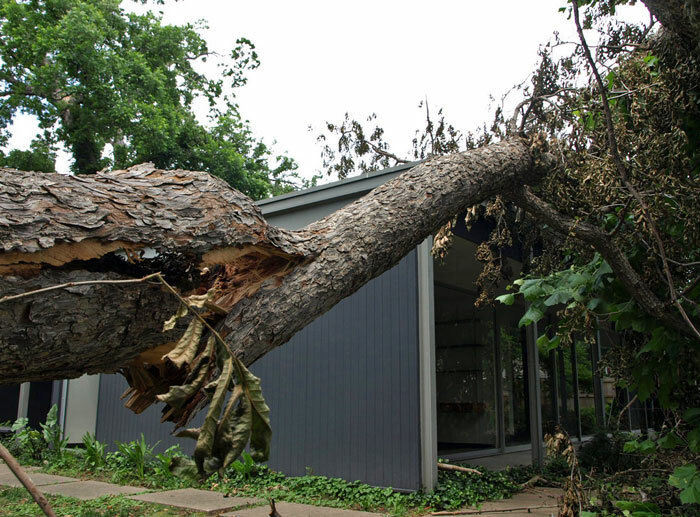 Back in 2008 I snapped these photos after an Oklahoma storm had toppled trees near the house. Fortunately the falling foliage did not land squarely on the home, and only caused minor damage. The Jones house restoration will showcase interior upgrades and landscaping intended to highlight this showplace of modernism. A $10 donation is suggested, and all proceeds benefit the Oklahoma Interior Design Coalition. Great article in the Tulsa World today! Photo from the open house are on the OK Modern Facebook page!